Real angels (not the greeting cards kind) are forever saying, Get Up, Wake Up, Get On With It. My creative daimon operates the same way. He has never heard of a body clock. He has no interest in what time it is, or how much sleep I get, and knows that what I most need to do with this body is to create with passion, entertain the spirits, ignite creative and healing fire in others... and marry the worlds. I felt the wind of his wings in the middle of the night in Paris. I was staying in a studio on the Street of the Moon Man and the Sun Woman, as I have renamed this section of the Rue du Faubourg Saint-Denis because of the statues a couple of blocks away. After a long day leading my Active Dreaming workshop, followed by dinner at a pleasant brasserie opposite the Gare de l'Est, I rose at 1:00 a.m. and sat at a table to write some of my new book. In France, it seemed natural to write about my "far memories" of other lives lived here, and to narrate how I have used the tools of dream archaeology - marrying shamanic dreaming to scholarly research - to investigate one life in particular: that of Charles d'Orleans, the medieval poet-prince in whose name Joan of Arc went to war. Three hours later, I was satisfied with a fresh 3,000 word draft and had written a couple of shorter pieces, so I thought I might put my body back to bed in order to be rested for the morning workshop session. Flat on my back around 4:00 a.m., I found my body was nowhere near flirting with sleep. I considered my situation from the perspective of a greater entity I felt was with me in the space. I sensed the wind of his wings. I rose from my body to join him and look down at the Robert body sprawled under the sheet. From this perspective, I had no concern, no worries, about how much sleep the body in the bed might get, or what might be done with it, as long as it served my creative purpose. I agreed with the daimon: let’s get that body up. Let’s get on with the new book. So I did, and turned out another 2,000 words. When the time came to shower and dress and get myself to the workshop, I was charging on all cylinders. Writing is a workout, and the creative act is energizing and healing. And the extraordinary becomes easy when we entertain our creative spirits and borrow their wings. I sit down to lunch at a breezy cafe table at the edge of the little Vilnelė river, just across the bridge from the Old City of Vilnius and the bed and breakfast where I am staying on a narrow cobbled street. There is a mermaid in a wall on the other side of the river. My companions are a Lithuanian therapist and Zen practitioner named Agne, who is a brilliant translator for my workshops here, and dreamers from the Netherlands and Sweden who will soon be traveling with us to Kernave for the depth adventure in dream archaeology I will be leading there over the weekend. Our conversation is lively, and turns (of course) on the play of dreams and synchronicity. I pause to swallow a mouthful of an excellent local "live" (unpasteurized) beer, and a bright-eyed, bearded man with long hair leaps up from a neighboring table. "Your conversation is fascinating," he declares, "I invite myself to join it." He introduces himself as Tomas Čepaitis , the Foreign Minister of the Republic of Užupis. Is he joking? He doesn't look like any foreign minister I have ever encountered, and his republic sounds like something from a story book. Our Swedish friend has heard of it, though. She tells us she read a big feature article about Užupis in the Stockholm paper that same morning; she later showed me the article, which describes Užupis as "the coolest little republic in the world." Tomas gives me a copy of the constitution of his republic, which includes such fundamental principles as "A dog has the right to be a dog" and "Everyone has the right to be unique." I learn that the word Užupis means "On the Other Side of the River" and has double meaning. The territory of the republic is about 150 acres of a once largely Jewish and then (post-Holocaust) notoriously seedy and dangerous neighborhood across the river from Old Vilnius. But "the other side" also means the other side of reality. "Our work is similar," Thomas tells me. "Like you, we are dedicated to bringing the dream world and the ordinary world closer together." He introduces me to the President of Užupis and other government officials. The Republic On the Other Side of the River declared its independence in 1997, unfurling its own flag, currency and cabinet of ministers. This is essentially a republic of artists, and their work is everywhere on the cobbled streets, in luscious murals and voluptuous goddesses, in pagan symbols and Surrealist provocations. At one of the main art centers, the Gallera, a Belgian-Lithuanian exhibition is opening that weekend, Tomas tells our dreamer from Belgium. We have our picture taken and Tomas informs me that he wants to appoint me Ambassador of Dreams for the Republic On the Other Side. I tell him, naturally, that I would be delighted to assist the Republic in growing its factory of dreams. In a later email exchange, the web of synchronicity became tighter and stranger, Tomas told me that he had lived for several years in upstate New York, not far from my present home. Specifically, he had lived in the village of Ghent, N.Y. Ghent is about 10 miles from the farm where I used to live near Chatham, N.Y.; one of the people who worked on my house renovations after I purchased the farm lived in Ghent. The story gets better still. Tomas added that he had some "Mohawk drawings and dreams" from that period in his life that he was still trying to understand. It was in that same neighborhood on the edge of traditional Mohawk Indian country that I started dreaming of an ancient Mohawk woman shaman and entered the visionary adventures that persuaded me to give up my previous life and become a dream teacher. I returned to Užupis on Monday, to admire the goddesses and have lunch at the same cafe on the river with a view of the mermaid in the wall. I discovered that the Republic also has a king, a splendidly fat and self-confident tiger cat named Nicas, who has his private entrance to the restaurant and is well-fed and well-petted by everyone, including the group at our table. Consulting the constitution of Užupis, I read that "Everyone has the right to love and take care of the cat." 1. Carry strawberries at all times. 2. When a boat is sinking, pelt the occupants with strawberries. Note: Užupis declared its independence in 1997, unfurling its own flag and presenting its own president and cabinet of ministers. It has yet to be recognized by any government in ordinary reality, but it has a seat in the United Nations of Dreams. At breakfast time today, a group of us were sitting comfortably with our bowls of cereal, our plates of cheese and fresh baguette, and our tea and coffee in front of the low burning fire in the great hearth, sharing dreams and other experiences from the night. One woman told me, "I have no dreams." "Then you must make up a story immediately," I told her. After only a moment's hesitation, she produced a fine adventure story involving a "corsair" seeking a treasure in a deep cave that turned out to resemble a child's marble. The story maker agreed to let her story be used as a script for improv theater in our morning session, and we are eager to see the plot development and many levels of meaning that may emerge as others bring their imaginations and body language into the role playing. Another woman in the group shared a fresh dream in which she was lugging an immense crate of hot water bottles - full of hot water - around a residential complex that she knows. Exhausted by carrying all this weight, she threw one of the hot water bottles down some stairs. Immediately a splendid panther appeared. She froze, realizing she was in the presence of a dangerous and possibly hungry predator, then turned sideways. She now realized that the turn was a wrong move. In presenting her flank, she had placed herself in the posture of a game animal, something the panther might treat as food. She turned back to face the panther head-on, standing upright, willing herself not to show or emit fear. She felt the danger recede, and now a panther cub came up the stairs to stand with the full-grown big cat. She woke with a sense of great curiosity and high anticipation. In discussion, she revealed that she had met the panther in previous dreams, and that there has been an interesting progression. In earlier dreams, a panther had attacked her. Then she dreamed they were looking in each other's eyes. Now she is claiming her ground and the panther cub emerges. If it were my dream (I suggested) I would think that the panther in me is emerging. It is not yet full grown but it has room to grow. And it will help me to manage my energy and make sure that there is a fair energy exchange in what I do. I may be a compassionate and caring person, but the panther in my soul won't let me lug around all those hot water bottles, endlessly available to serve the needs of others. We saw how dreams often need to be read as a series. But of course dreams are not simply texts to be read, but powers to be embodied. Asked for an action plan to honor her visitation, the dreamer announced that she would climb a tree; she had already demonstrated she is good at this. i suggested it would be okay to leave claw marks. She also said she might now be willing to eat some meat, to feed the panther in her (not the human, who eschews meat). Her intention before sleep the previous night had been to access more of her creative spirit. What came was the panther, dangerous and beautiful. Once again we see how the big powers - the big stories - are hunting the right people to carry them. You are walking in the woods in the dappled light of a fine spring day. You enjoy the springy grass and crunch of leaves and twigs underfoot. You graze on some early berries. You see the flash of water, and pause to look down at a cool, fast-running stream where fish gleam among the currents. Wouldn't it be fun to try to catch a fish in your bare hands, like a child. You make a grab and, amazingly, you have a fish in your hand. You are suddenly, urgently hungry. You raise the fish to your mouth and chomp down and you enjoy the explosion of fish oil in your mouth. You may or may not have enjoyed raw fish before, but this live one is delicious. As you wipe your mouth and bring your hand away, you notice that you are not quite the same as before. The back of your hand is furry, and the hand is larger and thicker than you remember and it has sprouted claws. You have become a bear. You amble back to your cave. You remember the pleasure of taking a long winter nap down here, in dream contact with the Earth and your ancestors and the new life you would enter come the spring. For now, you are simply going to rest, and remember. There are many levels to your cave. Some will take you into contact with ancestors who may appear as human, animal, or other. You may have to face tests and challenges before you can know your own, on the deeper levels. You may have to calm the male bears, and the warrior males who pretend to be bears. What you most want to find is the Divine Feminine energy of Earth that alone can gentle and contain the violence of men and turn the wildness of the Bear into a power of healing and protection. 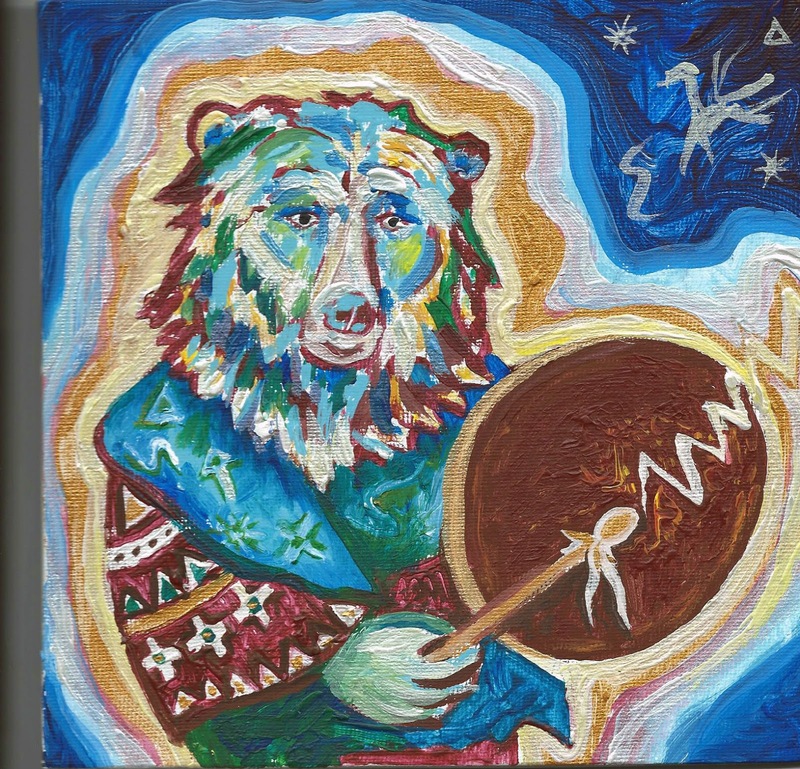 This is the invitation I gave to our circle for the first group journey in the depth adventure in "Dancing with the Bear: Reclaiming the Arts of Dream Healing" that I am currently leading at the Hameau de l'Etoile near Montpellier in southern France. The results were phenomenal. It is especially moving to be honoring the Bear as a medicine animal in a part of the world where a serious attempt at speciescide against all bears was organized under the rule of Charlemagne. The church became convinced that the ancient cult of the Bear was the mlost dangerous source of opposition to the Christianization of Europe and persuaded the emperor to order two "crusades" in which all men with arms were ordered to kill every bear they encountered. Thousands of bears were slaughtered in this attempted holocaust. Here in the Midi, this week, we are honoring the Bear and its many gifts, and seeking ways to cleanse the "berserker" in man. And I am thinking that the Turkish sculptor Cem Sagbil must have a fine instinct for how things operate in regions of the mythic universe that I have come to know well, and that work for me. I am one of the most lunar men you are likely meet (not to be confused, I hope, with "lunatic"). I have traveled much in the astral realm of Luna, and conversed with some of its more interesting residents. I have led shamanic group journeys to this realm. In my life I have been blessed to be balanced and warmed by the energy of the Solar Feminine. I resonate with traditions in which the Sun is a Goddess, as in Japan (Amaterasu), and the Baltic (Saule) and among many Australian Aboriginal peoples, and where the Moon is a male deity or at least a leading man to the Moon Goddess. I wander on into marché Saint-Quentin and admire glorious displays of cheeses and charcuterie, impossibly fresh and glistening fish, live eels and flowers that promise "20 Ans de Passion", Twenty Years of Passion. I buy a bag of cherries and munch them for breakfast, before coffee and croissant. I have to go back to the Moon Man and the Sun Woman and have my photo taken standing between them, balanced or otherwise, juggling dreams and spheres. This feels like the gentle beginning, in the Parisian spring sunlight, of another of the mythic irruptions that have stirred and confirmed or redirected my life. I like the word "irruption", which means a "bursting through". A mythic irruption, in my personal lexicon, is when archetypal powers of a deeper world break through the curtains of our ordinary perception and consensual hallucinations and carry us into a deeper game. This can be profoundly subversive of regular plans and expectations, of course. It can come as a blessing, as when we feel that an unseen hand has been placed over us, to protect, or that a sacred guide and ally is coming through - under many masks, or naked to our view (if we are able to look) - to help us find our way, as Athena came to Odysseus and spoke through a beam of the ship called Argo. So, on a lovely spring day in Paris, I give thanks for the day, and for the sense of the imminence of powers of the Otherworld within this one. And I reflect that part of the practice of living consciously at the center of the multiverse is to be myth-prone, or even mythopoeic: to be willing to engage with those deeper powers, and in doing to make anew the myths worth living and reliving, telling and retelling, in the neverending, never static story of the interplay between humans and the more-than-human. This Active Dreaming workshop I am leading is really bearing fruit! I go out in the walled garden where many people have gathered on the grass. They are excited. Happy energy is rippling through the whole group. I give them some words to repeat, as an initial meditation to shift their sense of identity and prepare them to make journeys beyond the body and brain. "I am a spirit that has a body." As they repeat this line, their bodies - now mostly stretched out full-length on the grass - roll as if in a gentle surf. I shift the emphasis, and they follow suit. As we go on playing with the words and the emphasis, the energy of the group in the garden grows and grows. We are ready for a great group journey. I take up my drum, getting ready to supply extra fuel and focus for the first of our group expeditions. I look up and see that we are in a grove of orange trees. The tree above me is bursting into fruit. I was leading the workshop in the orange grove in a very joyful dream last night, whose juice is still with me. I have used the same meditation, with the word play, in workshops in ordinary reality (though there is nothing very ordinary about our group adventures in Active Dreaming). It was inspired by my reflections on a Mohawk term for "alive". Kia:tonte literally means "I have a body", implying that I am a spirit that has a body. I have made a deal with my Boy Roberts, the ones who want to write and make worlds with and through me. Here's how that came about this week, in my creative writing retreat at Mosswood Hollow. They are rocking the car. Or maybe it’s the car that is rocking them, messing up their plan for the world. They have created a world in miniature with maps and drawings hung on a wire, and model figures and dioramas arranged on the floor. They are sitting with their backs to the driver, who has his back to them as he grips the wheel, driving in the direction he has chosen. The passenger area is quite large, like the inside of a London taxi. The boys are young, between six and twelve. They have a whole thriller plot figured out that may involve a War of the Worlds scenario, secret agents, a grand conspiracy, and lots of danger and derring-do. As they move their toys and hang things on the line or fold them or take them off, the outside world changes. For the man at the wheel, this is only a distraction and a fantasy. For the boys it is quite real. When the car hits another bumpy patch on the road, traveling much too fast for the potholes, the boy’s world is shaken violently, which means that terrible things could happen in the larger world around them, because the two are intimately connected. In fact they are one world. Doesn’t the man at the wheel understand this yet? Can’t he slow down or stop and make time to enjoy the fabulous view from the cliffs near the road? Isn’t there someone who can tell him to listen to the boys in the back and join their game of making a world? I have a notion who the boys are, and who the man at the wheel must be. I step into the middle of the road, commanding him to stop. Reluctantly, the driver complies, complaining that he doesn’t have time for this. He has plans, and a schedule to complete. I lean in the window, telling him to turn around and listen to the boys in the back. “We are the world makers,” they chorus. “So what is in your world?” The man sounds weary and skeptical. I am at the wheel now, ready to hear the deal the boys in the back have for me. “We’ll help you with your book,” they tell me. “On condition that you work with us every day on our book.” This doesn’t have to feel like work at all. A drawing, a cartoon, a set of little panel sketches like a draft of a page on a comic book. I start right away. I draw a boy looking through the open door of a bathroom. Inside there is nothing except cat litter boxes, lots of them, arranged on the floor. In my sketch, they look a lot like open graves. He wasn’t scared until he went to the bathroom and found it was full of cat boxes. Nine of them, the same number as the women in the library. A bit too long for the comic book page I produce, so I slim it down. The other panels are scenes taken straight from another of my dreams. Listen to the boys in the back. They are the world makers. Writers enjoy the thrill of petty larceny. Though I don’t recommend grand theft, I encourage people at the start of my creative writing programs to borrow lines, images and plot ideas from each other. At the start of my 5-day adventure in Writing as a State of Conscious Dreaming today, we accomplished this through a card game. I had everybody write a summary of a dream or a story or just a few good lines on one side of an index card. Then we took turns to pull cards from the deck and make up more of a story or script from whatever was dealt to us, pretending that the card we drew contained our own material. "That's the end of it, my story. May the next who tells it tell it better." This is the way I once heard a traditional Irish storyteller conclude a spoken tale. What a lovely encouragement for us to improvise and claim the power of a story that calls us by making it our own. Great stories are like this. They are more than twice-told tales; they may be neverending in their variants. Over the past two weeks, I've been recalled by dreams, bursting through in synchronicity, reincidence and mythic irruptions in daily life, to revisit the world of the epic poems beloved of the Greeks and of many who have heard them since. I dreamed I discovered an epic poem, in a neat typescript of maybe 200 pages, that I had started composing in 1987. This seemed just-so. I emerged from that dream feeling that the epic was complete; it was just a matter of reclaiming those pages and getting them to the write people. Why 1987? Well, that was a year when I started keeping very copious and detailed journals that helped me to write my way through a period of immense shamanic crises of ordeal and initiation that involved braving monsters and sirens and clashing rocks, on the inner planes and sometimes in the physical world too. I dreamed that I had brought through a book - perhaps the same one - that delighted me and many others, and that this accomplishment had required me to make an offering in words. So I composed a short poem ("Sing in me, creative spirit") that I offered last weekend in a fire ceremony in the midst of a circle of 30 active dreamers on the mountain where we have been gathering for many years. Reflecting on all we have shared on that mountain last Sunday, many of us recalled the weekend we devoted to bringing alive the wild odyssey of Jason and the Argonauts in quest of the mysterious Golden Fleece. We thrilled to the tale of passion, sorcery and jealousy in the romance of Jason and Medea. I found myself cast in the role of Phineus, once a king and always a truth-seer, who was punished by the gods because he always aw true and thus exposed secrets of heaven. They set the Harpies on him, to steal his food and crap on the remnants, until Argonauts drove the Harpies away. No shortage of volunteers in our group to play those Harpies! Though the best-known version of the Argonautica comes from the Greeks - specifically from the Hellenistic writer Apollonius Rhodius - the story is much, much older, at least as old as a Hittite tablet from the 14th century BCE, now in an Ankara museum, that contains a tale remarkable similar to that of Jason and Medea. And since Apollonius (and before Hollywood) there have been other retellings that are worthy of close study. In my favorite used bookstore in my home neighborhood, last week I chanced upon a book that had just been paced in New Arrivals: David Slavitt's remarkable translation of the Argonautica of Gaius Valerius Flaccus, composed in the 1st century. Little is known of Valerius except that he was a member of the group that had custody of the Sibylline Books and the supervision of foreign cults. His special knowledge must have helped him to present fascinating descriptions of many ancient modes of divination. And he is no slouch at describing what happens when a goddess becomes enraged! Through his lines - as rendered into supple, sinewy English by Slavitt - I was transported to the nightmare battle at Cyzicus, and into a dream of Hercules grieving for his lost boyfriends, and to the deck of the Argo on stormy seas, hearing Athena's voice in the timbers of the ship she has infused with her power. Sing in me, O Muse, of the man of many ways. 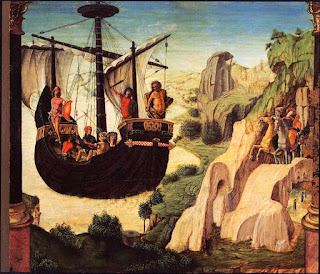 The adventures of the Argonauts are rich, and the mystery of the Golden Fleece - stripped from a ram that could take its rider flying and swimming - is something to dream on. Yet Jason, sent on a suicide mission by a paranoid tyrant, is a less interesting protagonist than Odysseus, the homecoming warrior who must be healed and cleansed in the world of the Feminine, and transit a land of dreams, before he can reach his native shore, where his hardest ordeal, that of truly coming home, yet awaits him. 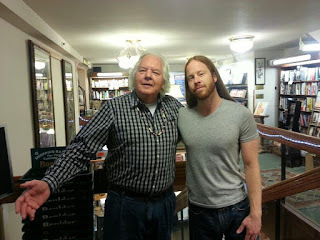 So when I arrived at the Boulder Bookstore on Thursday evening to read poems in my new collection Here, Everything Is Dreaming, I was delighted to be welcomed at the desk by a young lady named Athena. "Where's Odysseus?" I demanded, recalling how he was guided and saved by that goddess. "Odysseus is in the store," said a manager. "I'll call him." Within minutes, Odysseus appeared, a well-built young man with the flowing hair and beard appropriate for "the strong-greaved Achaeans, breakers of horses." He works for the bookstore. 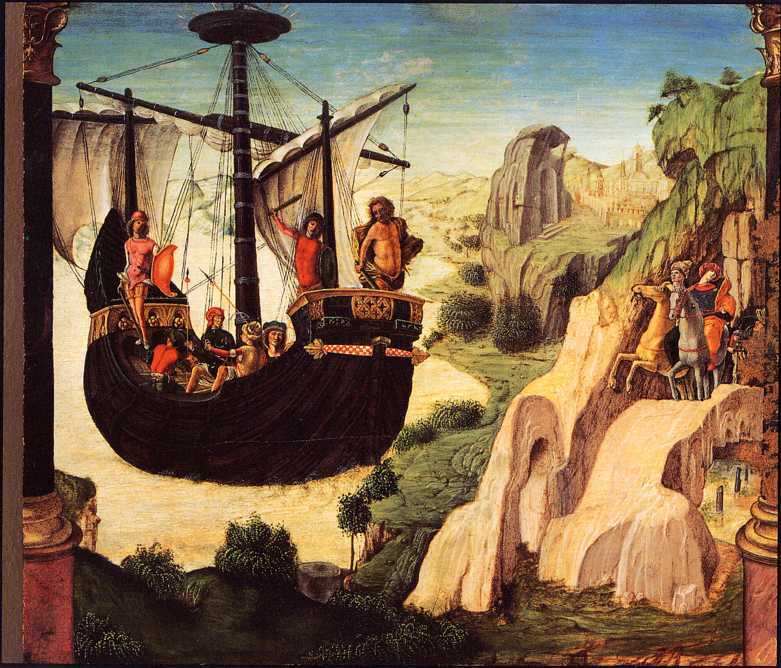 How did he come by the name of Odysseus polytropos, the "man of many ways"? his parents lived in Greece and chose his name. There are moments when it is impossible not to notice that powers of the deeper worlds are pushing through the curtain walls of our consensual hallucinations, enjoy interplay with humans. When I arrived at the Gaiam TV studios on Friday morning to record an interview, I was offered a cup of espresso by a young lady named Gaia, with a magnificent tattoo of the great Earth Goddess on her arm. Then I was introduced to a studio producer whose middle name is Icarus. "I hope you don't fly too close to the sun," I quipped. He heard me, and raised me. "I don't think Icarus fell to earth," he told me. "He shed something and went on shining." That's my Boulder epic, for now. May the next installment be even better. Before I embarked on my journey to Boulder today, I found myself again deeply immersed in the Greek epics, especially the Odyssey and the Argonautica. So I chuckled when Colorado friends informed me yesterday that I would be arriving on the heels of a winter snow storm that had been named - in some comic elemental wordplay - Achilles. At my home airport, I paused to admire and puzzle over a great red balloon, shaped like a dialog bubble in a comic strip, that shouted OMG. This felt like a happy cosmic shout out. I had to stop to take a happy snap. An elderly woman with the sharp, quizzical features of a bird paused so as not to get between my lens and the great OMG balloon. On the plane, I found the same lady sitting next to me. When I greeted her, I was surprised and delighted when she replied in an accent almost identical to mine. I would call that accent Anglo-Australian. It is nothing like the Strine of Crocodile Dundee, more like BBC English, yet with a kind of informality and with definitely no effort to sound either "posh" or "common." We started sharing notes. She was born in Sydney ten years before I was born in Melbourne. Her maiden name was the same as my mother's. We had to pause in our now very lively conversation because a younger man was standing over us. "You are in my seat," he told my neighbor, brandishing his boarding pass. "But I was led to my seat," my rowmate protested. "The flight attendant brought me here." When we checked her boarding pass, we saw there had been some confusion. She was supposed to be sitting two rows back. She offered to swap seats with the man who was supposed to be sitting next to me, and he agreed. "Things could get really good now," I remarked. "When seats get mixed up and plans get screwed up, the Trickster comes into play." She recounted some of passages of her life, with remarkable verve and humor. She had lived in Montpellier in southern France, where I have taught for several years and where I am traveling again later this month. "Now I am Helen of Troy," she laughed. "Have you heard of Troy, New York?" Had I heard of it! I lived there for ten years as a result of a remarkable series of dreams and coincidences described in the introduction to my book Conscious Dreaming. "My middle name is Hypatia. Do you know about her?" Indeed I do know about the great woman philosopher and scientist of Alexandria in the fourth century. 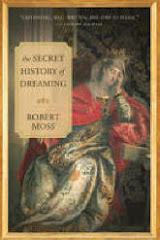 She was the mentor of Synesius of Cyrene, the philosopher and early bishop of the church whose treatise on dreams is my favorite book on the subject before the modern era; I devote many pages to him and his correspondence with Hypatia in The Secret History of Dreaming. The list of parallels between our lives grew and grew. She told a wildly funny story 0f how she spoke in Italian at a laboratory in northern Italy named in honor of her father, a pioneer of radio transmissions. Over-confident of her command of the language, she thanked her audience for their "jockstraps" instead of their "support". I matched this with a hilariously embarrassing episode in Paris in which I was casting roles for an impromptu dream theater and had my host play the role of a seal that had come out of the water in a woman's dream. Quite oblivious to the fact that I did not know the French word for "seal", I kept calling him by another word until his wife jumped up and down and said, "Robert, the word for seal is 'phoque'. You've been using an old word for piece of excrement. Stop calling him a piece of sh-t and call him a phoque." Our conversation was getting livelier by the minute, and the match-ups continued to multiply. We talked about our experiences as Australians living in North America. I remarked, "Sometimes it's useful to be Australian. Once, after 9/11, I was allowed to get away with leaving a knife with a nine inch blade in my carry-ons because the TSA guys understood thanks to Crocodile Dundee that Aussies have to have their knives. I was made to take it back to the check in and have them put it in my suitcase." (I can't do justice to this story here, but you can find it elsewhere.) Not to be bested, Helen of Troy told me, "Four years ago I packed a sharp knife in my grandchildren's carry-ons, along with their sandwiches, so they could use it on a picnic. They found it in the scanners at Bradley airport and let me take it home without a reprimand." One thing more we had in common: getting away with inadvertently trying to take knives through airport security, because we were Australians. More important than all these amazing match-ups was the way she was functioning, as the conversation continued and deepened on the two-hour flight to O'Hare, as a reviver of memory. She reminded me of very specific places and elements in the Australian landscape that I have been seeking as I work on a book that involves the challenging experiences of my Australian boyhood. Her delight in language, and languages, brought alive my own lifelong engagement with foreign phrases that have made foreign mindsets native to me. And she reminded me of Sirius, which she called the Dog Star. She was an astronomer by profession, and she spoke brilliantly of the formation of star systems. We spoke of constellations that I saw in boyhood but can't see where I now live, and of Sirius, which she called the Dog Star, which has always been part of my dreaming. Where was she going today? To Colorado Springs, to take part in an Olympic-level springboard diving meet. At 76, and using a cane? Absolutely. The vital energy of Helen Hypatia was amazing. She seemed to have more of that than all the people on the plane put together and I told her so. We had broached the subject of dreams more than once by now. The picture of her standing straight on the high board before flying into the air reminded me of a song that came bursting through me last week. Then I remembered something else. In the language of Inuit shamans, there is a word for "dream" that translates literally as "that which makes me dive in headfirst." Helen Hypatia loved this. She said she would make it her meditation on the springboard the next day. On my next flight, my rowmate was a nurse practitioner busily preparing for a conference in Denver on wound healing. We talked about the role of the mind and of imagery in accelerating healing, and I delivered a paean of praise for nurses, such spirited and practical people - and over the past 20 years, the #1 occupational group represented in my workshops. I couldn't help making a semi-learned joke about Achilles' heel to the nurse going to the conference on healing wounds. "You know, we are coming in on the heel of Achilles, the part of him which, when wounded, can never heal." At Denver airport, I gathered my bags and boarded a shuttle for Boulder. The heel-marks of Achilles, in the shape of melting snow and ice, got more and more noticeable as we followed the Tollway towards Boulder. The man next to me loved Tokien and had been to New Zealand, so we were soon deep in conversation about how Peter Jackson seems to have the NZ government at his beck and call; its tourism promotion strategy is to represent that green and mountainous country of mists as Middle Earth. Our talk was interrupted by a very loud crack. Not a blowout. A rifle bullet? OMG. A very large stone had hit the windshield right in front of our driver's face. It had made a pattern of concentric rings, but the windshield had not shattered. The driver kept her cool and managed very well. It was a puzzle to her where the stone had come from. We were a good distance from other cars, and she was sure it was not a bit of gravel thrown up from the slurry that the road maintenance people lay down for traction in snowstorms. The stone was over two inches in diameter, "like a river stone." By the way, Helen Hypatia and I agreed that OMG means O My Goddess. I'm a goddess kind of guy. Postcript: The epic theme continues. 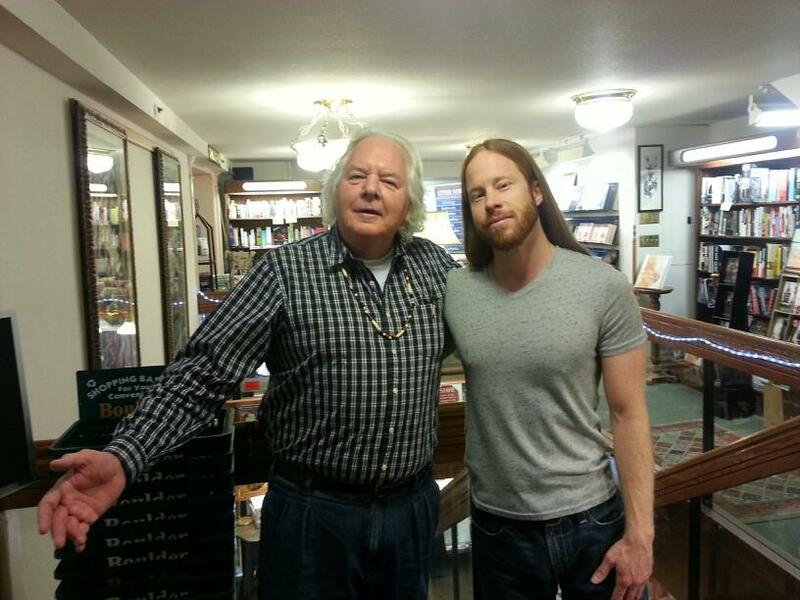 When I arrived at the Boulder bookstore, I was greeted at the upstairs desk by a young woman employee named Athena. I promptly said, "Where's Odysseus?" A manager responded, "He's in the store. I'll call him." In a couple of minutes, Odysseus appeared, with suitably long Achaean hair and beard. I greeted him with the opening line of the Odyssey: "Sing in me, O Muse, of the man of many ways." I asked how he came by the name of the most famous wayfarer in Western literature. "My parents named me Odysseus. They lived in Greece for a while." I made a point of reading some of the poems in Here, Everything Is Dreaming that were inspired by encounters with the mythistory of the Greeks, poems like "Birth of Apollo."